This colourful first dictionary introduces over 200 essential first words. Each word is illustrated and explained with a simple definition as well as a contextual sentence. There are icons to show which words can be 'sounded out' easily and Letterland phonics stories to help children learn and remember new spelling patterns. Useful extra reference pages include: colours, numbers, shapes, days, months, and words we use a lot. 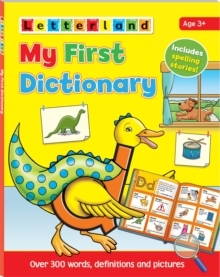 With the alphabet at the edge of every page and the Letterland characters' help, it is easy for children to find their way around this first dictionary.